We’ve all been there! Your guests’ arrival is imminent, and there’s no time to put your dog away. The bell rings, your dog goes wild, and as soon as your guests come through the door, they’re flattened against the wall by an exuberant greeting from a highly excitable and energetic bundle of fur. How do you train your dog to stop jumping on your guests? Having been on the receiving end of much dog jumping, I know what it’s like. I’ve been pushed over, bruised and slobbered on. One time, I nearly had my arm broken by an 80-pound Bulldog who jumped up on me as I came through the door, grabbed my wrist, and led me hastily to his dog bed. “Don’t worry,” said his person, “he does that to everyone he likes!” I’m pretty sure she meant it as a compliment, but I was in too much pain to feel very flattered. I love dogs who say hello with energy, and it’s always a relief as a trainer to be greeted by a dog who is pleased to see me. Still, not all dogs who jump are eager for attention or social contact. Sometimes dog jumping behavior can be a dog’s way of coping with a change in the environment that makes him nervous. It’s pretty easy to recognize an uncomfortable jumper, especially if you know how your dog reacts to new people. A nervous jumper exhibits much stiffer body language than a dog who is excited to see you and may eye guests warily as they enter his space. Regardless of why your dog is jumping, the aim is pretty much the same: Teach your dog that four on the floor is better than two on you. Four on the floor, or in this case eight on the floor. Photography by Shutterstock. 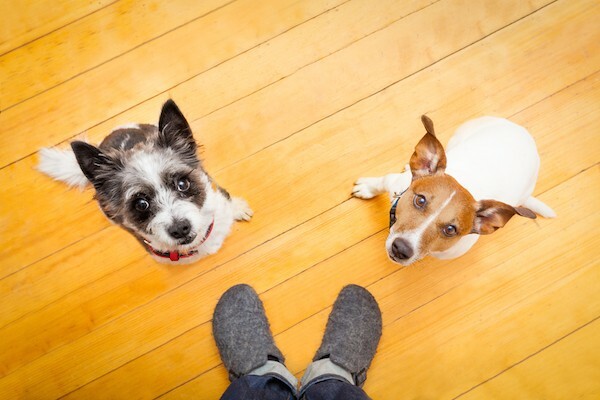 Teach your dog to keep four on the floor at all times with every person he greets, including you. Sometimes pet parents reinforce jumping behavior by allowing their dogs to jump on them, but telling them “off” when they jump on other people. There needs to be one rule for all. Harness the power of giving your dog something else to do, especially during times when he is most likely to jump, such as when people come to the door. The energy and adrenaline that drives jumping behavior has to find another outlet. Teach your dog a different activity for when people first arrive. For example, he could go to fetch a toy or run to a mat or bed and stay there until cued to come off. This requires a certain amount of impulse control and can be difficult for excitable dogs. But if you make learning fun and reinforce success with motivating rewards, you will get the behavior you desire. Prevent dog jumping by training your dog to go to a certain spot when guests arrive. Photography by Shutterstock. Teaching your dog cues to find alternate behaviors is key. A sitting dog cannot jump, so utilize family members, friends, and neighbors to help you practice his sitting on greeting. Start by teaching these basics in a quiet environment and with calm volunteers. Later, you can take it to where the jumping behavior usually happens, which in most cases is by the front door. Once your dog is sitting consistently as a person walks through the door, introduce auditory triggers that get your dog excited, such as a knock or bell ring. 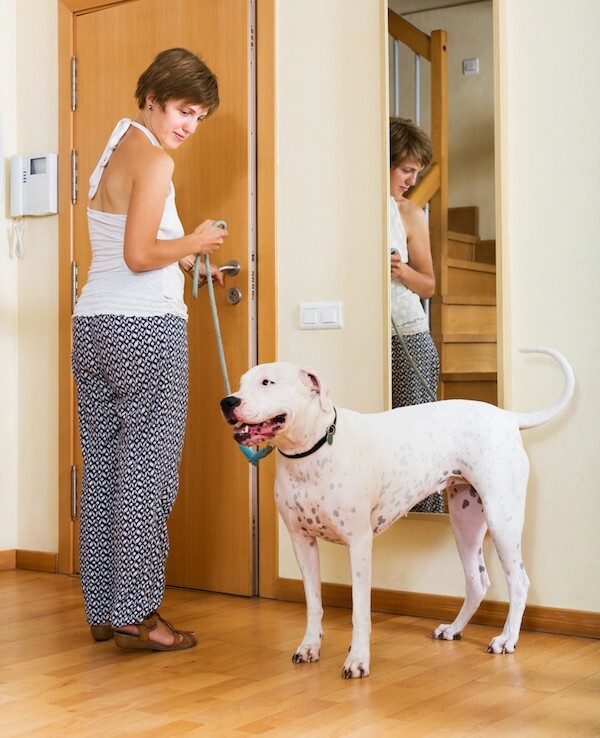 Wait for your dog to calm down before opening the door and letting someone in to greet. If he jumps up, your “guest” will turn around and leave, and the secondary reward goes away. If he sits, he gets attention and a reward. Make sure your dog is calm before opening the door. Photography by Shutterstock. Only practice off-leash when your dog is consistently performing what you need him to do, and always expect failures — they’re a normal part of the learning process. If your dog is wary of strangers, keep everyone safe and comfortable by keeping him behind a baby gate, or in another room or “safe zone,” until your guests are settled. If he is wary but social, allow him to greet calmly; if he prefers his own space, give him an activity toy and leave him in his safe zone. Sometimes dogs forget what they have been taught and jump on their owners or guests. If this happens, ignore your dog and turn your back, or keep turning around until he gets off. Wait for four seconds of paws on the floor before giving attention. If your dog jumps again when he has attention, repeat your behavior until he realizes that jumping gets nothing, but four on the floor gets him all the attention he desires. 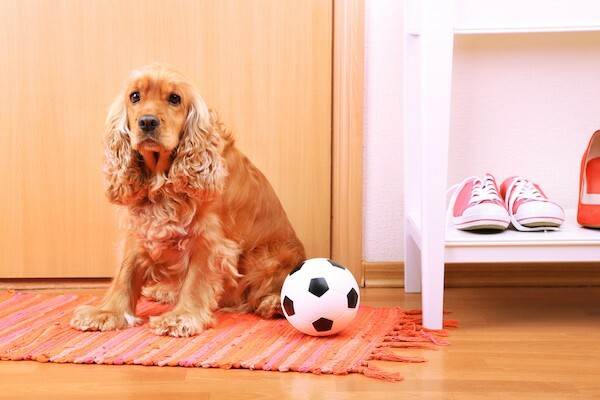 Teach your dog a different activity when people first arrive at your house, such as running to a mat or bed. .Photography by Shutterstock. Don’t knee your dog in the chest, yank his collar, shout, shock or physically reprimand him for jumping. Even though these actions might “fix” things for that moment, they don’t actually teach a dog anything. Also, you will usually find your dog continues to jump when a similar situation arises. Teaching him what to do instead will encourage him to make better choices the next time he feels the need to jump up. Modern vs. Traditional Dog Training: What’s the Difference? of Positively.com, and the CEO of Victoria Stilwell Positively Dog Training — the world’s premier global network of positive reinforcement dog trainers. Connect with her on Facebook and on Twitter. Editor’s note: Have you seen the new Dogster print magazine in stores? Or in the waiting room of your vet’s office? This article appeared in our magazine, and we’re thrilled to have Victoria Stilwell as a contributor. Subscribe to Dogster and get the bimonthly magazine delivered to your home. Read an interview with Stilwell on Dogster. The post Is Your Dog Jumping on Guests? How to Train Him to Stop appeared first on Dogster.